Someone said that last week at a conference in the mountains of Virginia. Though I cannot remember which of several speakers is due credit for the words, the thought has stayed with me, and I carried it into the weekend, especially into Sunday’s Celebration of All Saints and All Souls at my church in Yorktown. As parishioners entered the sanctuary, they wrote down names of loved ones who have died. Later, as the congregation made its way to the altar for communion, those names were read aloud. Many of the people mentioned probably had been “successful” in their lives in a worldly way—but success by that definition was not what put them on the list. I thought about the people I had named. Lida, my mother, a stay-at-home mom, Girl Scout leader, pediatric ward volunteer. Bill, my father, a high school principal, gardener, visitor of shut-ins. Joe, an English professor, close listener, poet. Mabs, a college friend, gracious host, cancer fighter. After the service, I began thinking about other kinds of people the world could use more of. Bird watchers, water conservers, and recyclers. Grandparents (not just biological ones) and godparents (not just ones assigned at baptism). Farmers and organizers of farmers’ markets. Bicyclists and bicycle repair shop keepers. Therapy dog trainers. Artists, dreamers, and dream interpreters. Bridge builders, both literal and figurative. Road workers, and drivers who slow down for road workers. Prayer bead makers, prayer rug makers, and those who pray. Medical researchers and hospice volunteers. Native plant cultivators and people who buy and plant native plants in their yards. Trash collectors, both those who get paid for their work and those who pick up litter simply because they can whenever they are out walking. People who smile when they check out and bag groceries, and people who smile at the ones doing the checking out and bagging (whether the checkers and baggers are smiling back or not). Bell ringers. Storytellers. People who love to sing rounds. And yes, in this week of elections, polling place workers and polling place watchers, the former to ensure that voting equipment is up and running and the latter to ensure that all voters get a fair chance to use it. And oh, yes, politicians willing to work for the common good, and voters to elect and support them. Those are some of my ideas. Those kinds of people give the world more of what it needs, not by being “successful” but by increasing the pool of faith and light available to the rest of us on our journey. Who would you add to the list? What this world needs is not more people who are successful but more people who are peacemakers, poets, lovers of all things. 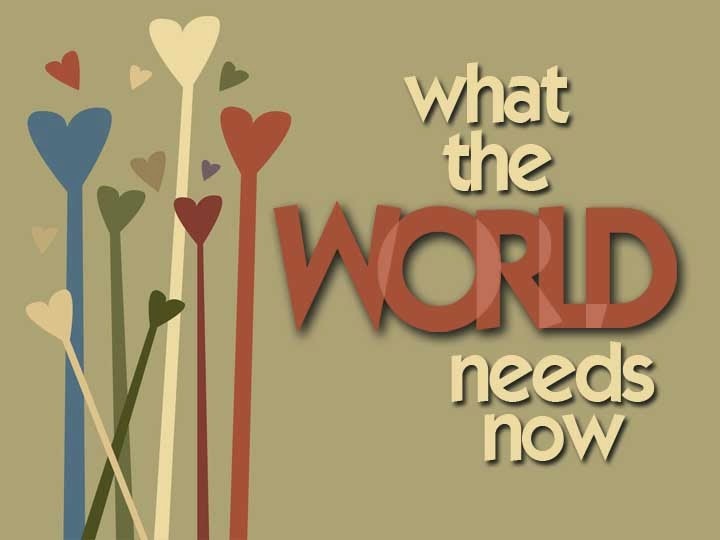 Here’s the deal: We are all called to give the world more of what it needs. May we each find ways of answering that call.